Asheville Butoh and Asheville Contemporary Dance Theatre are honored to present the Asheville Butoh Festival April 20 – 23, now in it’s 11th year. The 2017 festival features international guest artists as well as local butoh artists. We are pleased to welcome Paul Michael Henry from Glasgow, Scotland and Ken Mai from Japan via Helsinki, Finland. Both of these seasoned butoh dancers have toured their work throughout the European festival circuit, including Edinburgh Festival, WOMAD Festival UK, Moving Bodies Festival in Italy and Ireland, FLOW Festival in Helsinki, and various butoh festivals worldwide. New work by local butoh dancers Sara Baird, Jenni Cockrell, Julie B. Gillum and Constance Humphries highlight the festival as well. The 2017 Asheville Butoh Festival includes 4 evenings of performance April 20 – 23 Thursday through Saturday at 8:00 PM and Sunday at 7:00 PM. Workshops are on Saturday April 22 and Sunday the 23rd, 1:00 – 4:00 PM. All events take place at the BeBeTheatre, 20 Commerce Street in downtown Asheviille. Paul Michael Henry​ has trained with many of the best known Butoh masters alive today, including Yoshito Ohno, Yukio Waguri, Akira Kasai, Masaki Iwana, Kayo Mikami, Seisaku & Yuri,​ Tadashi Endo, Yumiko Yoshioka, Imre Thormann, Yuko Kaseki​ and Gyohei Zaitsu.​ Since 2001, he has been making performances and other artworks. His starting points are dance, music, writing and ritual. The end results can be body-based performance, multimedia work, writing or pure improvisation. Henry is artistic director of UNFIX Fes​tival​ in Glasgow, Scotland where he is based. UNFIX​ is an evolving festival of performance and ecological activism set up in 2015 in Glasgow and New York. Henry’s workshop, entitled The Dreaming Body​ is a synthesis of his training along with his own experiences with personal research. The Asheville Butoh Festival​ is thrilled to offer this workshop​ on Sunday​ April 23, 2017 1:00-4:00 PM​. Ken Mai​ has studied the unique styles of both butoh founders, Tatsumi Hijikata and Kazuo Ohno​. Mai’s style of performance and teaching combines butoh elements with his own background in acting, German expressionist dance, gymnastics, martial arts, singing, Zen, and yoga. He has been performing his solo dance work throughout the world, teaching, as well as directing and collaborating with internationally acclaimed dancers, actors, musicians, sculptors, and visual artists. Mai currently resides in Helsinki, Finland where he has been since 2008, teaching at the National Theatre Academy of Finland​. He previously worked in Kyoto 1998-2006 and made a name for himself in his home country with many significant performances in Japanese cities including Kazuo Ohno Homage Event “Kazuo Ohno’s Universe and Flower”​ (2004) in Osaka with Kazuo and Yoshito Ohno​ present in the audience. Mai has directed professional dance and theatre companies as well as university programs as far away as Mexico City, Buenas Aires, Helsinki, India, and Oxford. Mai has also worked to benefit patients with Multiple Sclerosis​ in the Czech republic. Ken Mai ​will premiere Requiem of Flower​, a solo he created for his 2017​ US Tour​ that includes San Francisco, Chicago, Seattle, Portland and Asheville. Requiem​ is about the life and death of a flower, expressing the universal law of life, death, and rebirth. This simple poetic theme reveals the essence of all living things: human, animal, plant, and insect. To dedicate one’s life to the greatest achievement of beauty, wisdom, compassion, or instinct. To live so that there is no regret when death comes. Please consider making a tax deductible donation via Indiegogo: https://igg.me/at/11thashevillebutohfestival All proceeds go towards the production costs of the festival. All proceeds go towards the production costs of the festival. Production costs for the 4 evening-length shows are $3200. Your tax-deductible donations are going toward the cost of presenting these important performances at the BeBe Theatre. All funds raised will contribute to the costs associated with presenting this unique and important festival. Contact ACDT at office@acdt.org if you would like to make your donation tax deductible. 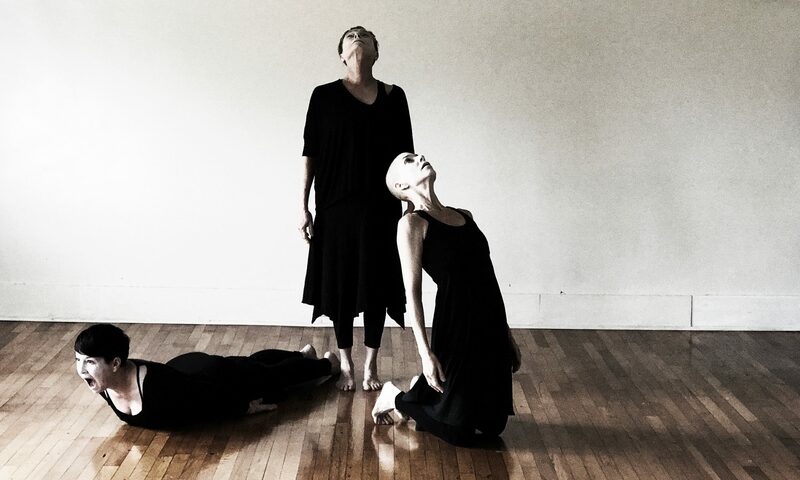 The Asheville Butoh Festival, produced by Julie B. Gillum and Asheville Contemporary Dance Theatre has happened eleven times since 2000 featuring national and international dance artists. Artists such as: Diego Pinon (Mexico), Sheri Brown, Joan Laage, Vanessa Skantze (Seattle), Yumiko Yoshioka (Japan /Germany), Vangeline (New York) and Nicole LeGette (Chicago) have performed in downtown Asheville at the BeBe Theatre. In addition to Gillum, local butoh dancers Sara Baird, Jenni Cockrell, and Constance Humphries have made significant artistic contributions to this vibrant and growing festival through the years. Butoh was founded by Tatsumi Hijikata and Kazuo Ohno in Japan in 1951. This avant-garde dance form was a reaction to the westernization of Japanese culture after WWII. Butoh is directly influenced by the artistic movements of German Expressionism, DADA, and Surrealism and Japanese primitive rituals, the theatrical arts Noh and Kabuki, and the traditional Japanese society. In the 1960’s and 70’s, Japanese dance and theatre artists Akaji Maru (Dai Rakuda Kan), Amagatsu (Sankai Juku), Eiko and Koma, and Min Tanak continued to shape butoh. Butoh often creates fragmentary, dream-like moments shrouded in satire, metaphor, and mystery. It is this intellectual yet visceral experience that makes butoh vital in our contemporary times as it seeks to address technological transformation, humanity’s struggle to understand cycles of life and death, and shifting perspectives that embrace a global viewpoint.